The Office of the National Public Auditor (ONPA) announces the release of Audit Report No. 2019-01, a performance audit entitled MiCare Plan: Challenged by Oversight and Management Issues; New Team Optimistic About Future Prospects, which covered the fiscal years 2013 to 2017. The audit report is available for public viewing here, or online at http://www.fsmopa.fm. Likewise, printed copies are available at ONPA in Palikir, Pohnpei. The Public Auditor’s authority as codified at Chapter 5, Title 55 of the FSM Code gave us the power to conduct this audit which focused on MiCare Plan’s administration, including oversight and monitoring arrangements for the health insurance plan. The objectives of this audit included determining if (a) management and oversight systems provided adequate assurance that operational goals and objectives were achieved, and (b) MiCare Plan had implemented proper system for monitoring, reviewing and reporting including assessing priorities consistent with the aims and objectives of the health insurance plan. 9. Lack of oversight and guidance to manage accounts receivable. We offered numerous recommendations to remedy the issues and weaknesses in areas such as corporate governance, annual operational plan and budget, risk management, performance evaluation, information technology, performance monitoring and reporting, internal policies and procedures, code of ethics, and accounts receivable. Management response to the findings and recommendations, which were mostly in agreement, is included in the final report for your perusal. In a week-long workshop facilitated by Maria Lúcia Lima, from SAI Brazil and INTOSAI Development Initiative (IDI), and Eroni Vatuloka of PASAI, the Tonga Office of the Auditor-General (TOAG) is currently moving onto the next phase of their implementation of international standards on performance audit, as part of a pilot involving only a few SAIs around the world. The first phase of the implementation of the ISSAIs - mapping the current performance audit practice to determine the ISSAI implementation needs - was completed earlier in the year. Components relating to financial and compliance audits were then carried out in May 2018. The TOAG workshop participants with the Facilitators and the Tonga Auditor-General. This week’s workshop prepares the TOAG staff for the second phase of the ISSAI implementation which focuses on the adoption of the ISSAs compliant audit methodology and the conduct of the pilot audits. Once this is completed, the pilot audits will go through a quality assurance process (phase III), to ensure that the audit results have complied with the ISSAI. It is hoped that these pilot audits will open up more performance audits of government programmes to report on economy, efficiency and effectiveness in the execution of government budgets. 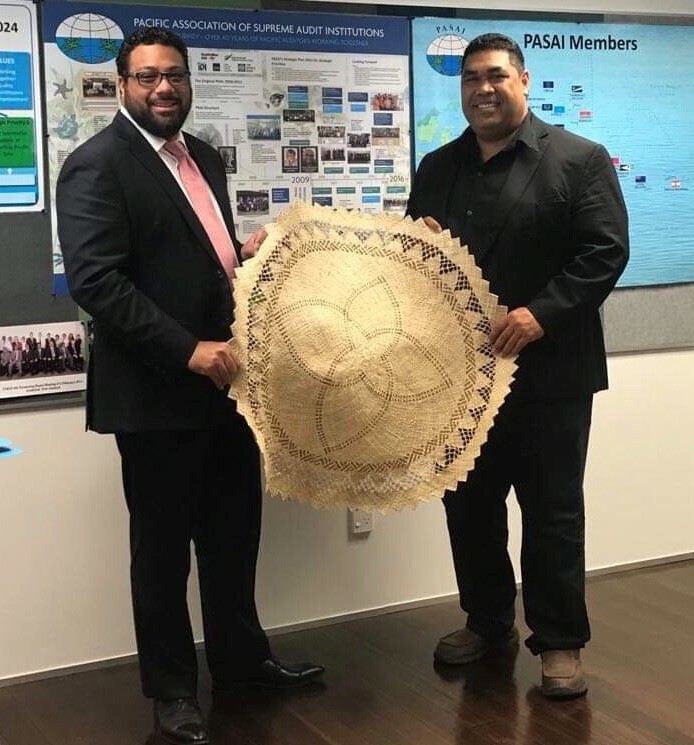 PASAI acknowledges the kind contribution of the Australia Department of Foreign Affairs and Trade (DFAT), the New Zealand Ministry of Foreign Affairs and Trade (MFAT) and IDI in the programme. Audit (CPA) of Preparedness for Implementation of Sustainable Development Goals (SDGs). 11 to 15 June 2018 in Nadi, Fiji. Standards of Supreme Audit Institutions (ISSAIs). audit plans and participated in the audit planning meeting in Suva, Fiji in November 2017. Audit Office facilitated the meeting. and Trade and the New Zealand Ministry of Foreign Affairs and Trade. 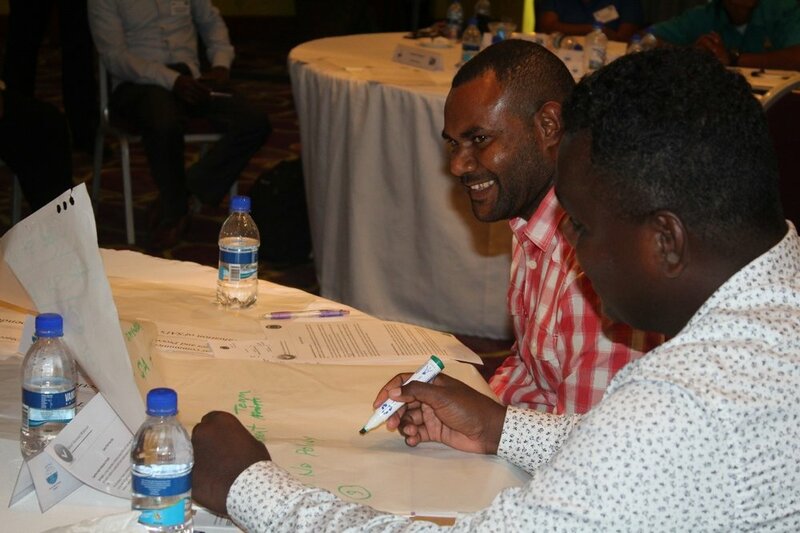 The New South Wales Audit Office (NSWAO) and the Office of the Auditor-General of Solomon Islands (OAGSI) conducted a phase 3 training under the twinning arrangement to support the OAGSI. The training was aimed at building and enhancing the capacity of staff on audit from planning an audit to execution and reporting. Part of the training was using on-live audits in TeamMate (auditing software). • Efficient and effective reviewing of work papers in TeamMate. Fourteen Auditors of the OAGSI attended this training meeting from 16 to 27 April 2018. The ten day training provided these auditors with the opportunity to share ideas and experiences, do team presentation on the topics learnt each day and receive guidance on ‘how to’ plan the audit effectively, identify key risks and different sampling methods. Two experts from the NSWAO) provided this guidance. On the final day, auditors were allowed time for questioning and comments on areas covered during the ten days training. The auditors have gained new technical skills and enhanced the current auditing skills to carry out their work effectively. The workshop was facilitated by two Audit Managers Ms Roopal Rachna and Mrs Farisha Ali. It was supported by Australian Department of Foreign Affairs and Trade. OAGSI acknowledges the support of NSWAO and also the Australian Department of Foreign Affairs and Trade. 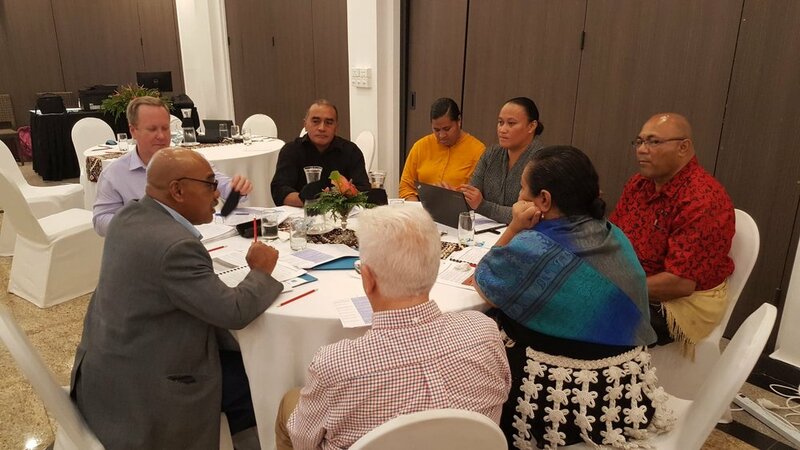 The Tonga Office of the Auditor-General (TOAG) on Monday 30 April 2018 commenced a workshop on Stage II of the implementation of the international auditing standards called the ISSAIs (International Standards of Supreme Audit Institutions). 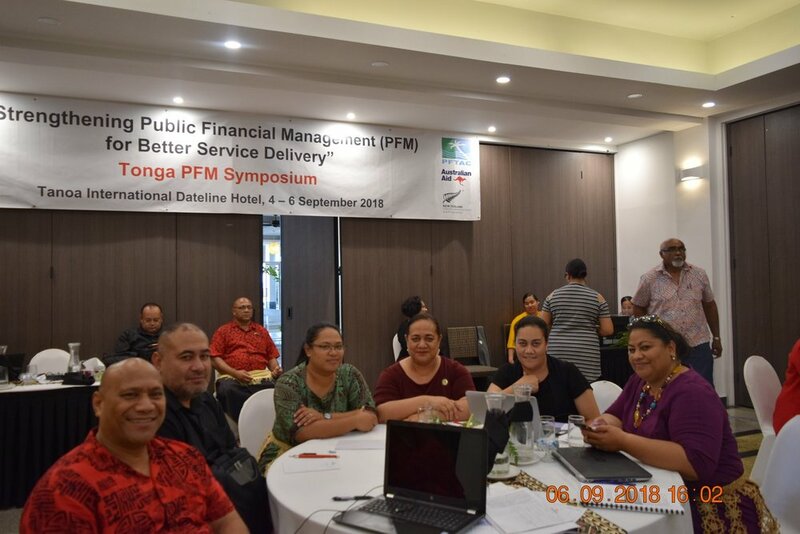 The week-long workshop is one of the activities of Australia’s Department of Foreign Affairs & Trade (DFAT)-funded project called “Support for the External Oversight Function of the Public Financial Management (PFM) System in Tonga”. The project provides support to the TOAG as well as the Public Accounts Committee (PAC) of the Legislative Assembly of the Kingdom of Tonga. The objective of the workshop was to discuss the ISSAI based compliance and financial audits methodology, as well as prepare the TOAG audit teams for pilot audits. The workshop was facilitated by Karma Tenzin and Shofiqul Islam of the INTOSAI Development Initiative (IDI) and Sinaroseta Palamo-Iosefo and Eroni Vatuloka of PASAI. TOAG, IDI and PASAI have signed an agreement to achieve the objectives of the stage II support and timely completion of the activities. The Australian High Commissioner in Tonga, His Excellency Mr. Andrew Ford, in opening the workshop stated that he was happy to hear about the results of the first stage of the ISSAI implementation – which was mapping the current audit practices to ascertain the implementation needs. He added that this second stage, the adoption of the ISSAI compliant audit methodology and conducting pilot financial and compliance audits, is important in the adoption of the international standards. The High Commissioner hopes that SAI Tonga (TOAG) will have progressed with the adoption of the methodologies for financial and compliance audits by the end of the workshop and looks forward to them using the ISSAI methodologies in the pilot audits. He reiterated the Australian government’s commitment to accountable and transparent Pacific island states, as government ministries and departments pursue their development outcomes. The Auditor-General Mr. Sefita Tangi thanked the Australian government for their continued support to the TOAG. PASAI acknowledges the financial support from both DFAT and the IDI to the implementation of ISSAIs in the TOAG. The Pacific Association of Supreme Audit Institutions (PASAI) and INTOSAI Development Initiative (IDI) continued with phase II of the SAI Performance Measurement Framework (SAI PMF) project for Supreme Audit Institutions (SAIs) in the North Pacific by facilitating a workshop in Majuro, Marshall Islands from 2 - 6 October 2017. Twenty two staff from nine SAIs attended the workshop. The Chief Secretary of the Republic of Marshall Islands, Mr Benjamin Graham, officially opened the workshop. In his opening remarks, he acknowledged the importance of SAIs taking stock of where they are and how they can continue to improve. He said, “This process of methodical self-assessment and continual self-improvement is common sense—but sadly not common practice among many organisations. By going through these performance assessments and peer reviews and diagnosing your deficiencies and areas for improvement, you are not only setting the bar high on your own performance, you are also setting an example for other public institutions to follow.” These comments echoed the core purpose of the SAI PMF tool and how SAIs can demonstrate the fundamental principle of SAIs leading by example. 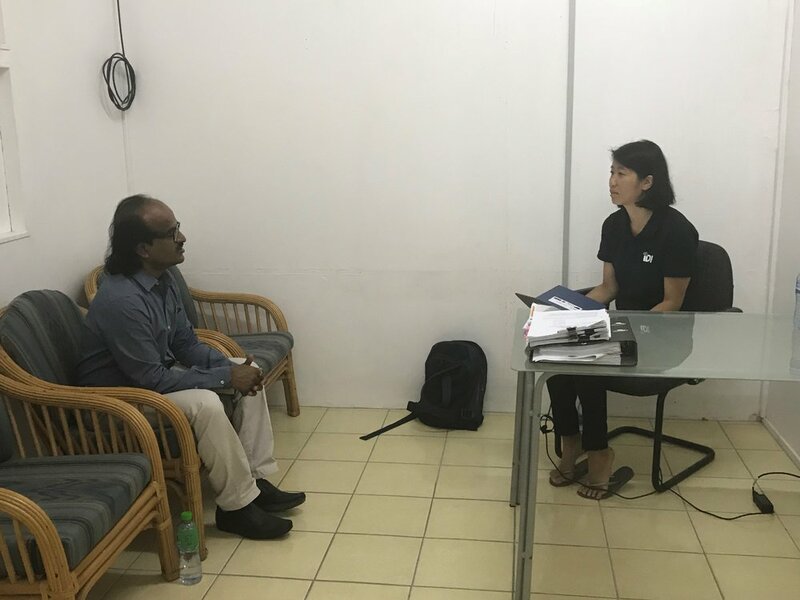 SAIs from Guam, Marshall Islands, Federated States of Micronesia (FSM) Office of the National Public Auditor, FSM States of Pohnpei, Kosrae and Yap have been assessed through the peer review approach and the assessment reports are being finalised. The peer review teams were supported by resource persons from the region; they were Ms Claire Kelly, PASAI Performance Audit Consultant, Mr Allen Parker, Director of Audit for Cook Islands Audit Office, Mr Kelepi Makakaufaki, Deputy Auditor General of Tonga Office of the Auditor-General and Mr Marshall Maua, Director of Strategic, Personnel and Corporate Services of Samoa Audit Office. The focus of the workshop was learning how to develop the qualitative evaluation, including identification of external and internal root causes of performance. Incorporating these external factors are crucial in explaining the SAI’s performance as these can either help or hamper the performance of the SAI. Each peer review team also presented and discussed lessons learned so far in the assessment, and preliminary high level results of their respective assessments. The next steps in the programme are for the peer review teams to finalise the full report taking on board the lessons learnt from the workshop on integrated analysis and preparing a report that is evidence-based, balanced and easy to understand. 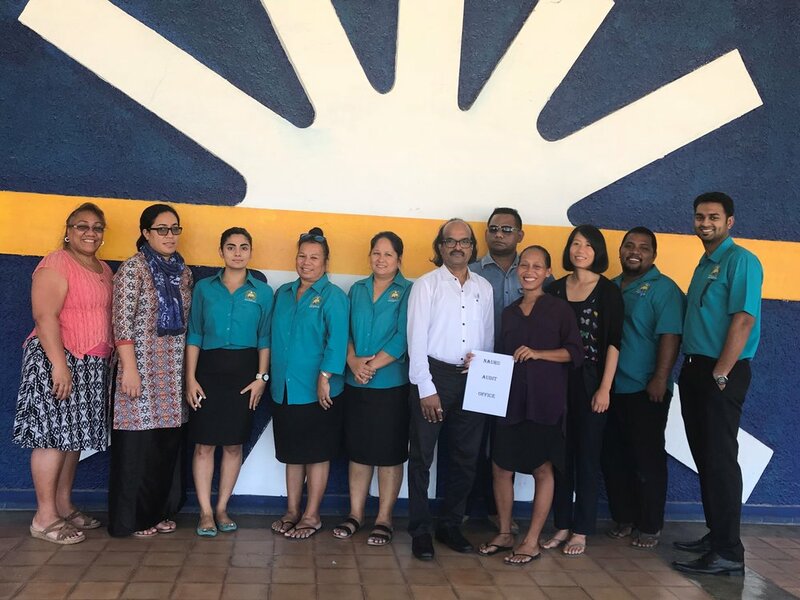 This programme is aligned with one of PASAI’s strategic goals requiring SAIs to develop a performance measurement framework to assist with improving the delivery of SAI’s audit responsibilities. The workshop was facilitated by Ms Cecilie Thue-Hansen, Head of SAI PMF Unit within IDI and Mrs Sinaroseta Palamo-Iosefo, PASAI Director Practice Development. This project is supported by the Australian Department of Foreign Affairs, INTOSAI Development Initiatives (IDI) and the New Zealand Ministry of Foreign Affairs and Trade. 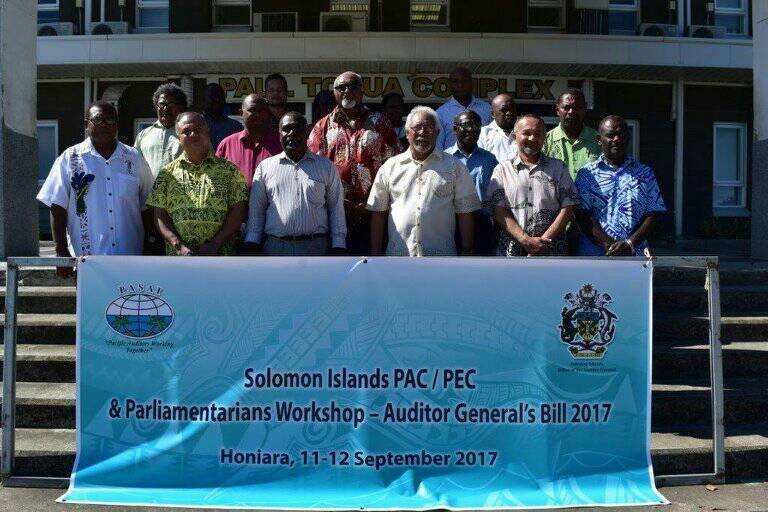 The Pacific Association of Supreme Audit Institutions (PASAI) and the Solomon Islands Office of the Auditor-General (SIOAG) conducted a series of workshops for the Public Accounts Committee (PAC), Public Expenditure Committee (PEC), Government entities and stakeholders at the National Parliament of Solomon Islands on 11th – 14th September 2017. The Speaker of Parliament Hon. Ajilon Jasper Nasiu when opening the PAC/PEC workshop stressed the importance for improvement of the capacity of members of Parliament in holding the executive government accountable on the use of public funds, in their contribution to better public administration and greater public confidence in the institutions ofthe Solomon Island government. PEC was held be on 11th and 12th September, for government entities on 13th and for stakeholders on 14th September. (e) to introduce a proposed Auditor General’s Bill 2017.
confidence on the SIOAG and the government. Zealand Ministry of Foreign Affairs and Trade (MFAT) in supporting the three workshops. The Pacific Association of Supreme Audit Institutions (PASAI) held their 20th Congress in Funafuti, Tuvalu from 8 August – 11 August 2017. Over 40 participants from 23 SAI members and development partners attended the Congress, which had the theme “Promoting the Values and Benefits of SAIs through Effective Communication”. Acting Prime Minister, also Deputy Prime Minister of Tuvalu Hon. Maatia Toafa was the keynote speaker at the Opening Ceremony, mentioning the importance of the Congress theme, particularly for Tuvalu and its recent update of their audit Act. “With these changes and increased powers, comes additional accountability. This accountability must be effectively communicated to stakeholders in order to be demonstrated,” said Hon. Toafa. The Prime Minister of Tuvalu Hon. Enele Sopoaga hosted a state dinner for the PASAI Congress delegates on the night of the opening of Congress. Welcoming the SAI Heads from around the Pacific, he applauded their role and those of public officers in general, in leading their nations in trust and respect. Speaking about the Tuvalu government, “This government is fully committed to the principles of transparency, good governance and accountability,” he said. Congress delegates participated in productive dialogue during the communications workshop, coming up with creative ideas and viable solutions for the challenges whichmany of them face in promoting the values and benefits of SAIs and engaging their stakeholders. Important decisions were achieved during the PASAI AGM and business sessionsthathavepositionedPASAIpurposefullytoachievetheirstrategicplan and objectives for the region. 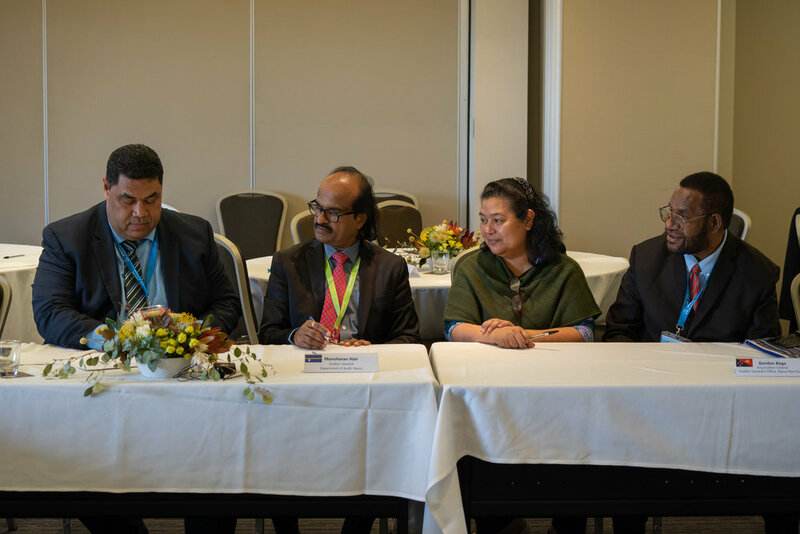 The Governing Board of PASAI also held their 17th meeting on 7 August 2017 as part of the Congress proceedings. SAI Heads recognized the importance of having more dialogue with their colleagues, stakeholders and development partners locally to build strong relationships and trust for maximum engagement for the work that their SAI is doing. This would in turn strengthen accountability and transparency across the region. “The Congress has been a successwith key decisions being made by the members relating to future funding of PASAI to ensure effective delivery of the PASAI strategy” said Mr. Ihlen K. Joseph, Public Auditor of Pohnpei State - FSM and outgoing Chairman of PASAI. Auditor-General of Tuvalu, Mr Eli Lopati with his staff and the wider community, hosted the Congress with joy, warmth and unique Tuvalu flavour. Sharing their life and culture through food, dance, music, singing and a special excursion to Tepuka island, Congress participants were treated to an exceptional insight to Tuvalu. 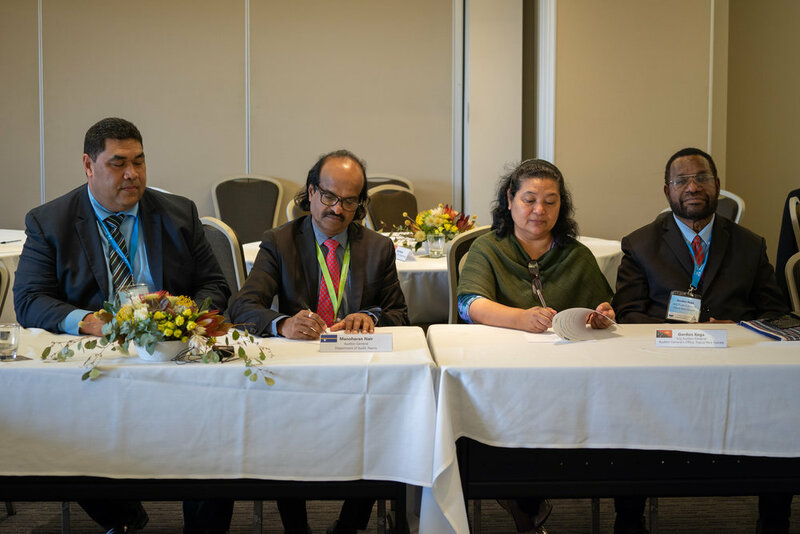 PASAI acknowledges the Australian Department of Foreign Affairs and Trade (DFAT) and the New Zealand Ministry of Foreign Affairs and Trade for their valued support with this Congress. Delegates of the 20th Congress in Funafuti, Tuvalu. A workshop on Conducting Mapping and iCAT (ISSAI Compliance Assessment Tools) was held at the Tungi Colonnade Hotel, Nuku’alofa, Tonga for the staff of the Tonga Office of the Auditor General (TOAG). The workshop was delivered by the Norway based INTOSAI Development Initiative (IDI), an organisation that supports the strengthening of performance and capacities of government audit offices or Supreme Audit Institutions (SAIs) around the world. The workshop is the start of support to SAI Tonga for implementing ISSAIs (International Standards of Supreme Audit Institutions) under the Support for External Oversight Function of the Public Financial Management System (Tonga). The 30 or so participants which included the senior management staff of the TOAG, were trained on a method to implement ISSAIs in a holistic and phased approach. It is holistic as it involves the adoption and implementation of ISSAIs for financial, compliance and performance audits; and phased allowing the TOAG to be fully compliant with the standards over a period of time, while at the same time have minimum impact on the usual operational work of the TOAG. The workshop was facilitated by Shofiqul Islam, IDI Manager Capacity Development, and assisted by Eroni Vatuloka, PASAI PFM (Public Financial Management) Consultant. PASAI acknowledges the kind financial support of the Australian Government and the IDI in improving public financial management in Tonga. PASAI was in Tuvalu last week conducting a communications workshop, ‘Communicating and Promoting Value and Benefits of SAI’. 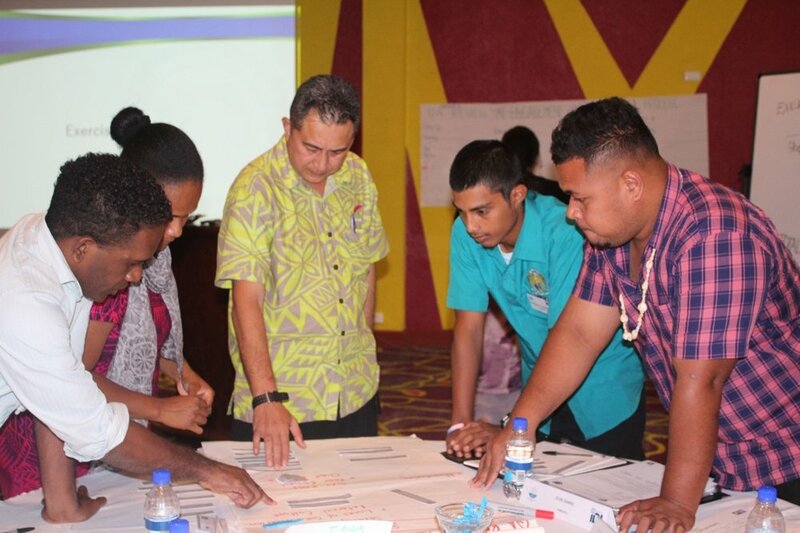 This workshop is the fourth SAI specific communications training that PASAI has delivered over the last12 months, with the aim to improve report writing and stakeholder engagement for its members. 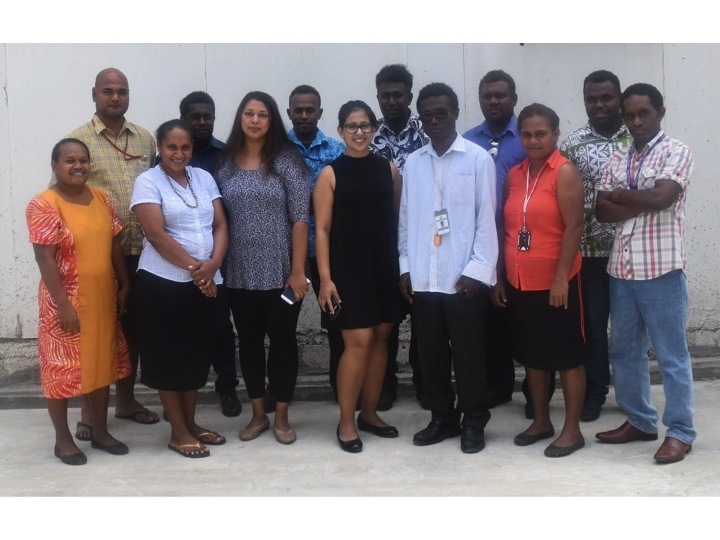 In addition to the nine staff of the audit office, participants also included three staff from the Tuvalu Broadcasting Corporation (TVBC) and the Media Liaison officer of the Prime Minister’s office. Participants actively engaged in discussions and activities that equipped them with strategies, tools and knowledge on how to create a communications strategy and write clear reports. The sessions also covered presentation skills, dealing with the media, social media and how to write media releases. The Tuvalu Office of the Auditor-General will be hosting the 20th PASAI Congress from 8 – 11 August 2017 with the theme “Promoting Values and Benefits of SAIs through Effective Communication”. This workshop has been a good lead in to the Congress. The training was co-facilitated by PASAI’s Director of Advocacy, Engagement and Financing, Aolele Su’a Aloese and PASAI’s Communications Advisor, Tina Vaka. The training was hosted by the Tuvalu Office of the Auditor-General and supported bythe Australian Department of Foreign Affairs and Trade (DFAT) and the NZ Ministry of Foreign Affairs and Trade (MFAT). Photo above: Participants of the Tuvalu Communications workshop with Auditor-General Eli Lopati (front row, second from the left) and guest speaker, Reverend Ken (front row, second from the right). 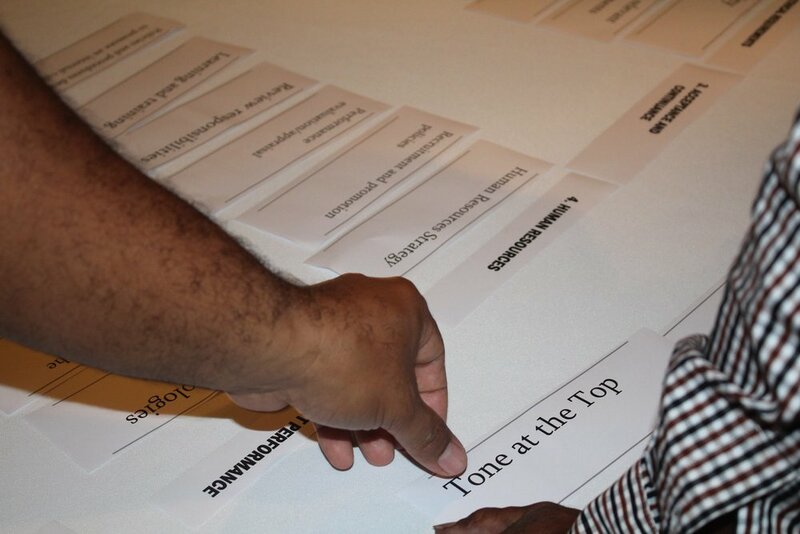 Photo above: Participants discussing who their stakeholders are.